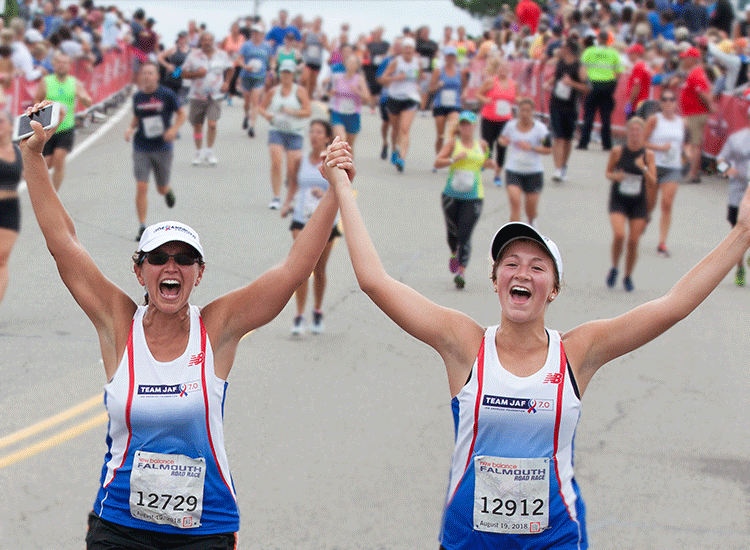 We are currently seeking Team JAF charity runners for the 47th New Balance Falmouth Road Race! Join us as we once again take to the scenic streets of Cape Cod on Sunday, August 18, 2019 and raise funds in support of JAF’s mission. While everyone is aware of the physical toll of cancer, many people don’t realize its devastating financial impact. Following a cancer diagnosis, an average family’s income can drop to $25,000 (or less) due to lost wages, making it difficult for them to cover rent/mortgage, utilities and other household expenses. JAF is committed to reducing the stress of financial toxicity by providing support to New England cancer patients and their families when they need it most. Since 2012, hundreds of Team JAF Falmouth Road Race runners have raised more than $700,000 to help fulfill our mission and allow patients to focus on what really matters during treatment – getting better. Will you join our team? For more information, please contact Gillian O’Brien at gillian@joeandruzzifoundation.org.